DC 37 Treasurer Maf Misbah Uddin joined the municipal workforce in 1988 as an Actuary working for the New York City Office of the Actuary. Actuaries make complex calculations for pensions and other related areas based on information such as life expectancies. Uddin has master’s degrees in actuarial science, mathematics and demography. Maf Misbah Uddin, president of Accountants, Actuaries and Statisticians Local 1407 since 2000, began his fifth term as treasurer of DC 37 in January 2016. Uddin became an active union member shortly after joining the municipal workforce as an Actuary in 1988. He holds masters’ degrees in mathematics, demography and actuarial science. Since becoming treasurer of the union, Uddin has devoted countless hours to DC 37’s annual budget process. In his first term as treasurer, Uddin began a budget process that improved the transparency of the union’s finances. He has persisted in working with DC 37’s accounting staff and other key workers to analyze expenditures and in making long-term capital improvement plans. Uddin’s expertise helped to keep DC 37 on budget during the trying times of immensely expensive repairs from the damage to the union’s headquarters in lower Manhattan following Superstorm Sandy in 2012. In addition to his work at DC 37, Uddin is a leader in the South Asian American community. 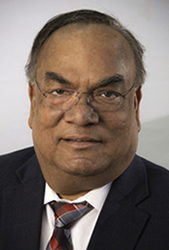 He is the founder and president of the Alliance of South Asian American Labor (ASAAL), which celebrates the many contributions of South Asians to the labor movement. Uddin was a major advocate pushing for New York City public schools to observe two of the most important Muslim holidays, Eid al-Adha and Eid al-Fitr, which were added to the school holiday calendar beginning in the 2015-16 academic year.